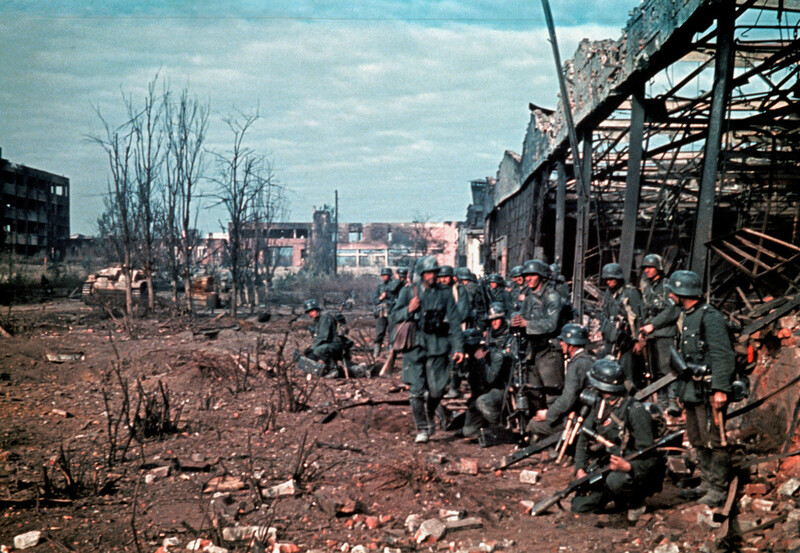 Preparing for an assault on a warehouse in Stalingrad, most likely in the later part of 1942. By September 1942, a brutal hand-to-hand battle was being waged inside Stalingrad. As they fought from house to house and street to street, the Germans found that all of the tactical advantages they had possessed in fighting across the steppes were lost in the close confines of the city. Tanks and the mechanized strategy of Blitzkrieg counted for nothing in an urban warfare. Because of the close proximity of the large city, the maneuverability of tank was impossible and not effective. Paradoxically, a sniper was more effective than a tank. Many times the soldiers used knives and bayonets to kill each other. The lack of supplies, harsh elements, and stubborn Soviet resistance eventually led to the defeat of the German Army. Bitter fighting raged for every ruin, street, factory, house, basement, and staircase. Even the sewers were the sites of firefights. The Germans, calling this unseen urban warfare Rattenkrieg (“Rat War”), bitterly joked about capturing the kitchen but still fighting for the living room and the bedroom. Buildings had to be cleared room by room through the bombed-out debris of residential neighborhoods, office blocks, basements and apartment high-rises. Some of the taller buildings, blasted into roofless shells by earlier German aerial bombardment, saw floor-by-floor, close quarters combat, with the Germans and Soviets on alternate levels, firing at each other through holes in the floors. German military doctrine was based on the principle of combined-arms teams and close cooperation between tanks, infantry, engineers, artillery and ground-attack aircraft. Vasily Chuikov, the Soviet commander of 62nd Army, developed the important tactic of “hugging the enemy”, by which under-armed Soviet soldiers kept the German army so close to them as to minimize the superior firepower enjoyed by the Wehrmacht. This slowed the German advance and reduced the effectiveness of the German advantage in supporting fire. Next years world cup preparations and their still finding bodie's from that terrible conflict.